June’s soaring temperatures were a useful reminder for anyone working in building design that overheating in buildings is an issue we must urgently address. Increasingly airtight and highly insulated urban homes are particularly prone, with excess glazing meaning mechanical ventilation is required to keep buildings comfortable in summer. Overheating is just one of the issues we can tackle at MACH Energy. We are now applying our technical and creative expertise to analyse a building’s performance holistically, using modelling to understand how a range of scenarios affect both the form and function of a building. Using this data, we can optimise the design and identify the ‘sweet spot’ where a building’s level of comfort (heat, light, noise) is balanced against its energy use and construction cost. For this holistic approach, we use our dynamic building physics modelling software to calculate how ventilation, thermal comfort, daylighting and acoustics all interact. In the case of overheating, we look beyond the design of the building’s envelope/façade to see how adjustments to its orientation, u values, glazing and shading would enhance the design. On a more human scale overheating is a familiar experience for one of our team, Chris Jones. Chris is presently training to run the 2018 London Marathon wearing an inflatable 7 ft. T-Rex costume, to raise money for the Evelina Children's Hospital in London, which has supported his 6 year old cousin James through his life-changing illness and operations for the past four years. Ze Nunes, MACH Acoustics’ founder, has promised to match any money raised in July for the appeal and will also contribute £5 for each comment received on this newsletter, so please support Chris via the links on the left and follow the training antics until the big day! Our team is steadily expanding here at MACH and we are now looking to recruit in our newly formed residential team, MACH Residential. We are looking to recruit site-focused individuals to join part of our testing team. The role will involve carrying out acoustic testing in line with Part E of the Building Regulations and also air tightness testing to Part L. Full training will be provided along with a vehicle; a driving license is therefore essential. 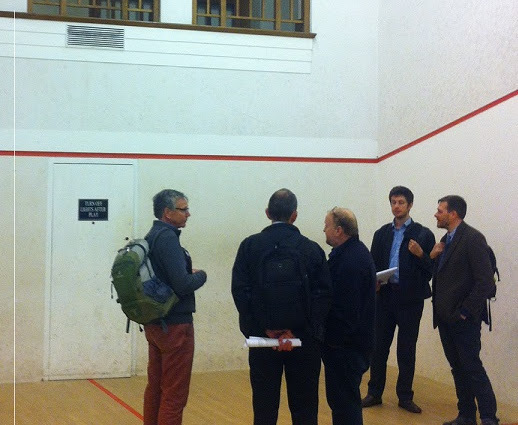 Whilst an understating of acoustics and mathematics is advantageous, it is not essential. Although we will consider all applications, and remain highly flexible, our current desire is to recruit at least one individual in the East of the country, with good access to London, working remotely. If you are interested in this position, or have a colleague or a friend looking for a new challenge, or even a change of career, then please get in touch. 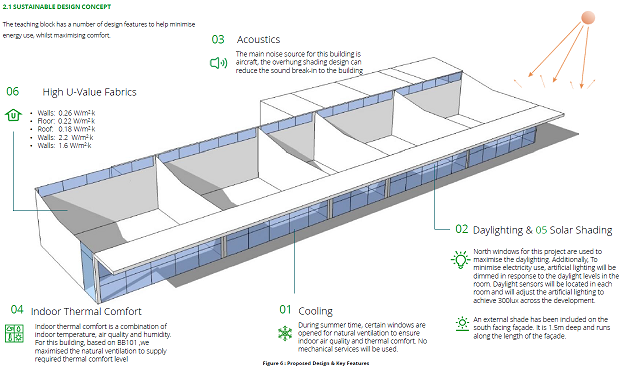 As acoustic consultants, we always strive to find the best solution, which for us means the most sustainable, flexible yet cost effective solution for a building. With the launch of MACH Energy, we are now extending our consultancy to address the whole building design – including ventilation, acoustics, thermal comfort and daylighting. Although some ventilation and heating systems for buildings can be relatively simple, the building physics occurring can be very complicated. In sustainable building design, finding the right solution quickly to a given problem can be challenging, especially when working with different consultants and teams. Clashes frequently arise that restrict the sustainability of a design – whether a home, school, office or hospital. A SAP calculation might require a specific wall that then negatively impacts a building’s acoustics. Or a noisy site might prevent the use of window openings and necessitate mechanical ventilation, when a thermal model or façade optimisation might otherwise lead to a naturally ventilated solution. Such clashes might take a month to solve with different teams working together – at MACH Energy we have the technical ability to arrive at the right solution much more quickly. Because we fully understand the ways in which ventilation, acoustics, overheating and daylight and energy use perform and affect each other, we can refine any design to find the ‘sweet spot’ where the building is at its most efficient and comfortable. What does MACH Energy offer? A highly technical yet creative, R&D led consultancy - First and foremost, we are engineers with a strong expertise in mathematics and extensive knowledge of building physics and sustainability. We relish a challenge and are always driven to find the most sustainable, aesthetic and future proof design for any building project. 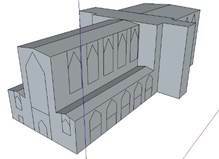 Our bespoke software and use of modelling means we provide risk-free, compliant designs. A multi-disciplinary approach – We bring a holistic approach and use our own 3D building physics software to model the performance of the acoustics, ventilation, thermal comfort and daylighting in any building. We look at how each element affects and is affected by the others in combination with a building’s usage/occupants’ behaviour and changing weather, traffic and light conditions throughout the year. From this analysis, we will produce a range of risk-free, compliant solutions which balance occupant comfort with the aesthetics and sustainability in a building’s design. When, how and why should you work with MACH Energy? For architects, we can support a competition design, give technical support before the M&E drawings and add design insurance. Our reports will increase a bid’s winning potential providing confidence in the sustainability of a design, insuring a more comfortable building for occupants. Our fast, holistic, technical approach ensures a quick set of solutions to design challenges or clashes. For a contractor, bringing us on board at an early stage reduces design risks, drives down energy consumption and reduces costs. We can conduct tender reviews and will work before M&E to ensure a design concept can achieve regulation compliance. By working directly with contractors, we offer greater flexibility, reliability and speed. What’s different about MACH Energy? · Collaborative and proactive – We believe in the importance of communicating our findings effectively, so we use highly visual reports. · Focused on value engineering – Our technical and detail reports remove risk and provide confidence in our designs, helping remove over-design and limiting energy costs in a building design. Women in Property welcomes you to this Mach Acoustics Presentation on ‘Acoustics in Building Design’ which will cover the crucial aspects of acoustic design in buildings. Buildings are not only different in form and function, but also throughout the life span of a building. From initial design through to conception and ultimately demolition, buildings develop from initial detailed design, to site and finally into a fully functional working building. 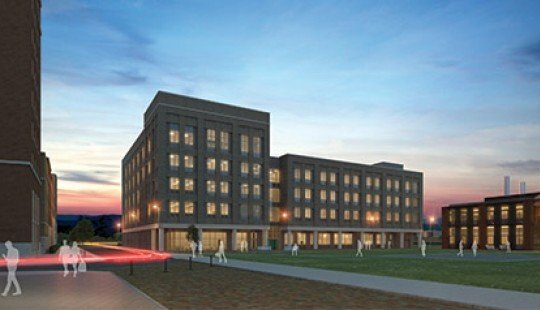 This presentation will delve into the lifespan of a building, by exploring acoustics in contractor’s proposals, employer’s requirements and legal provisions in addition to how web based tools and BIM is changing the way we, as professionals, are able to input into the acoustic design of a building. Places for this talk are £8 members and £18 non members (men welcome) to include evening drinks. The talk will be at Integral offices, Bath. Please email catherine@machacoustics.com for further details. Roary runs for Glory - Go Chris! After his success in completing the Brighton marathon Chris has heroically decided to continue his marathon career and managed to secure a place for London 2018. His story is inspiring and the cause a very special one. "I am running the 2018 London Marathon in full inflatable T-Rex costume! Think T-Rex Tuesdays, but for 26.2 miles! 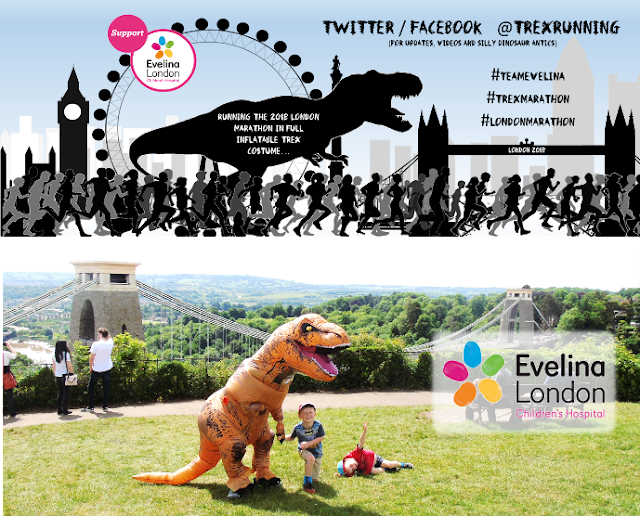 I'm hoping to raise a Jurassic amount of money for the Evelina London Children's Hospital. We have a great deal of thanks to give to doctors and staff for the amazing care of my cousin James, who when just 2 years old contracted a flesh eating bacteria that left him in intensive care for months. Now 6 and having gone through so many surgeries that I've lost count, it's easy to forget James' road to recovery given that he's such an active, sporty and happy child who loves to play rough! As a severe Haemophiliac I've also spent a fair amount of time in childrens hospitals myself so raising money for Evelina is a no brainer! I took up running 18 months ago and recently in April ran my first marathon in just under 4 hours, not overly fast for my age, so this is going to be a massive challenge!" Chris' T Rex tush-wiggling video and Just Giving page can be found here below and he'll be updating us with his progress. We all with him the best of luck for this big adventure and his heroic efforts. MACH is now pleased to offer additional consultancy services beyond acoustics. We have now decided it is time to branch out into a more holistic building design approach by including building physics, with the creation of MACH Energy. We have been working on this for the last couple of years and have been partnering with experts in the industry. We are now able to provide advice on natural ventilation, daylighting, energy use and thermal comfort as well as acoustics, of course. Where we believe we can make a real difference is by not looking at individual elements, but offering holistic consultancy that considers how each factor interacts with the other. You would be surprised on how the level of daylight in a room influences the internal noise level! Our approach covers façade optimisation and how we apply this to our projects. Please get in touch if you would like us to get involved on one of your projects. 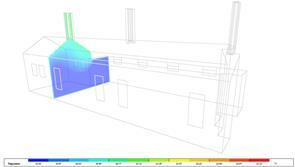 • A holistic approach to natural ventilation on noisy sites. • Design of windows to enhance their sound reduction. • Modelling techniques assessing the pressure drop and acoustic performance of openings within low carbon buildings. • Acoustics and heat recovery. For a taster of what is to come please click on the links below. Acoustics and the built environment: Have our Ears Changed? On an evolutionary scale, it is only recently that we have developed technologies and architecture that allows us to change our immediate environment so significantly that it can have little in common with our original living conditions. This has had an effect on every factor that determines our level of ‘comfort’; however for now I will focus on acoustics, and more specifically, noise. We can all agree that the natural environment is much quieter than modern man-made environments, and exposure to this increases our daily sound 'intake' to a level much higher than what our ears (and brains) have been designed to. 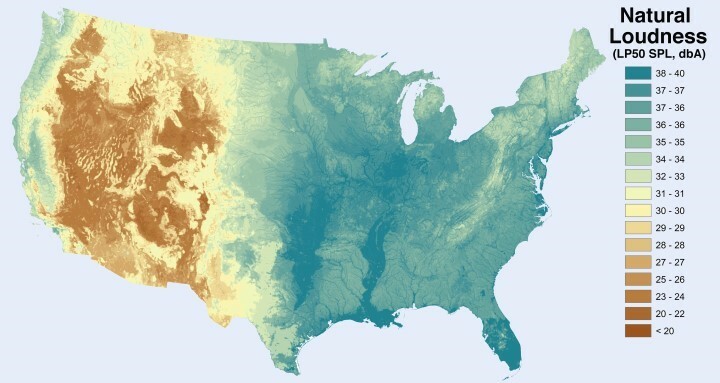 The US National Parks Service have produced a pair of noise maps that predict sounds levels across the US separately for natural noise and man-made noise (https://www.nps.gov/subjects/sound/soundmap.htm). We can see that the scale of noise level across the map from natural to man-made is increased by up to 27dB, with the noisiest areas predictably in city centres. What is most interesting about these noise maps is when we compare these noise levels to standard guidelines for internal living conditions. 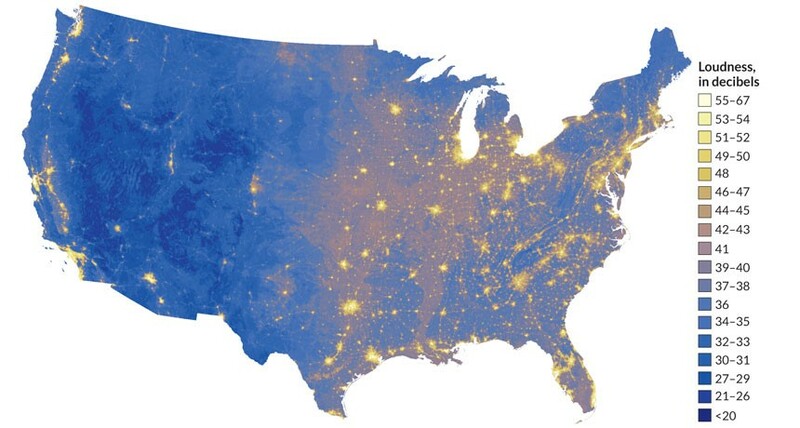 Predicted noise levels for the natural environment fall below 30-35dB(A) across the US, and when we compare this with good internal noise levels for resting and sleeping, we can see that there is a strong correlation. Does this perhaps mean that as a species our ears have not yet adapted to our new noisier environment? If so, what impact does this have on our health? Although exposure to extreme noise levels is universally agreed to cause hearing damage, the effect of prolonged levels of medium/high noise has not been fully agreed upon. Multiple studies link high noise levels to hypertension and decreased performance in education (Stansfeld & Matheson, 2003), whereas others have also shown links to ischemic heart disease (Passchier-Vermeer & Passchier, 2000). Either way, high noise levels will not have a positive impact on occupant health, and so the impact of this is a serious consideration to make when considering the design of your building. Ze had a great time last week presenting to Stride Treglown’s Cardiff office about the new developments we have going on at MACH. As always, the team there had some good questions and were really inquisitive about the new services we are now providing and how they could benefit them as a practise. Low carbon design and ventilation systems have always been a big interest to us, so it seemed a logical step to start looking in to these areas of design and how they interact with acoustics. This ‘holistic design’ approach centres around the balancing of thermal gains, ventilation and noise, which is affected by the façade U-values, glazing area, window types, ventilation strategy and external noise environment. It is only by working on all these design aspects that you can make sure that each element compliments the other. 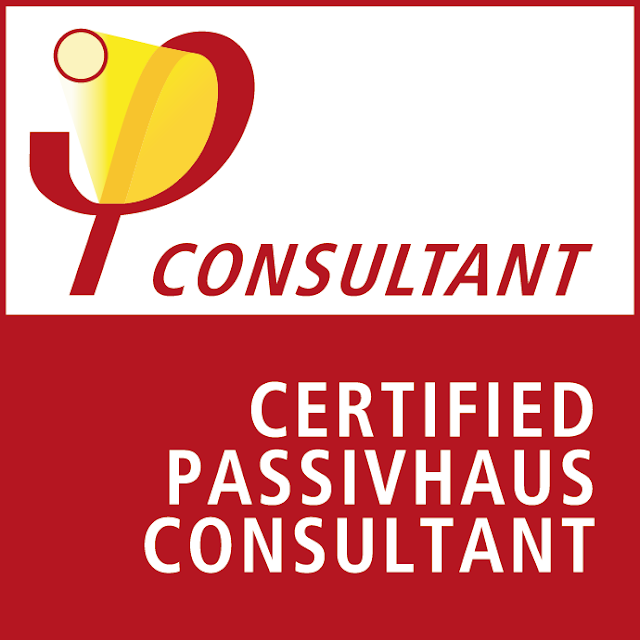 We are also able to offer Passivhaus design consultancy too. Both Emily and Max are both certified Passivhaus consultants and have already started work on a number of developments in London. As we start 2017 in new offices, we wanted to update our friends and partners about some of the latest developments at MACH Acoustics. Last year was our busiest year yet and saw us work on over 200 different projects, varying in size and scope. The business grew by 26% and we increased our team to over twenty staff, of which we’re happy to say a third are women. In January, after ten years with us, Stefan Hannan was promoted to Director. Stefan’s vast acoustics experience covers all sectors, particularly educational, commercial, residential and mixed-use developments. Ze, the founder of MACH Acoustics, is now focusing on new developments for the consultancy. These include: MACH Energy - thermal building analysis, MACH Testing - sound and air testing, SAP and SBEM assessments, detailed noise planning assessments and MACH Software - integrating acoustic artificial intelligence into BIM. We are always proud to see our designs win industry and client awards. Recently the Acoustics & Noise Consultants Awards 2015 & 2016 recognised two of our school designs – the Wallscourt Farm Academy design for its ‘advanced understanding of the acoustics of open plan spaces’ and the cross laminated timber-built Steiner School in Frome for its excellent sound insulation. The Keynsham Civic Centre - an open plan atrium, public library, retail and office space - won both a RIBA South West and a Sustainability award, an impressive achievement and an exciting project to be involved in. Ze and all the team at MACH would like to thank our progressive clients for their business in 2016. We are always keen to hear from old friends and look forward to working together in the near future to design beautiful, creatively engineered buildings! I asked this question around the office and overwhelmingly the one word that kept coming up was "curiosity". Curiosity, tenacity, a tidy mind and the ability to identify weak areas and challenge them by finding solutions. This pretty much sums up a review I'd write up of how truly excellent the current BBC2 series of Big Life Fix (with Simon Reeve) is. 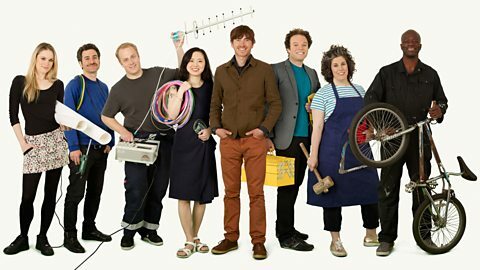 This programme showcases engineering and inventions and mixes those skills with kindness and empathy. Initially the challenges of everyday life are sought out - and curiosity prompts these to be overcome by seeking out solutions. Of course, having a technical background is integral to the solution, but it's imagination and the ability to think differently that greatly assists and frees these wonderful people. Watch it, enjoy it and marvel at how clever and compassionate people are. This will and should inspire the next generation of would be engineers and inventors - the world needs these skills and enquiring minds to be used as a force for good. · There are several social media site dedicated to what engineers get up to on a daily basis - here's a week in the working life of Josh, and it seems pretty full on with a great variety of projects. · UCA Farnham – performing arts building – lecture theatres, TV production studios and recording studios – near an RAF base with massive noisy chinook helicopters flying over it on a daily basis. Passivhaus is the world’s leading fabric first approach to low energy buildings. Following an intensive course of training followed by a 3 hour exam, becoming a certified Passivhaus consultant provides a deep understanding behind the fundamental concepts in making highly energy efficient buildings, from the early design concepts aimed at minimising unnecessary heat loss to the construction stages where detailing and workmanship are essential in ensuring the building performs as well in reality as it does on paper. MACH Acoustics is pleased to announce that Max Reynolds has now gained this qualification – following his interest in the subject and amassing both academic and practical knowledge. Watch this space for Passivhaus studies and content and how sustainable acoustics can work in harmony with this way of working. Find out how to take a green, forward thinking approach to all aspects of building acoustics including window design. In this bite size session, Ze Nunes, founder of MACH Acoustics, has been invited to present some lessons learned from lecturing & studying at the University of Bath (MSc in Sustainable Architecture and Phd “In the Visualization of Sound”). Ze has recently published two hugely significant books 'Sustainable Acoustics' and 'The Future of Windows'. Signed copies of both books will be available subject to printing dates being achieved. MACH Acoustics recognises the importance of noise control through window design. Where simple traditional design limits the use of open windows, MACH have now developed a range of unique software tools to help overcome noise break-in in residential buildings, offices and schools to prove that open windows can be used in noisier environments than previously thought. Ze will demonstrate how to take a green, forward thinking approach to all aspects of building acoustics including window design. 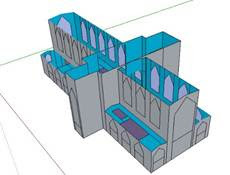 Best practice, the latest data, as well as useful ‘sustainable rules of thumb‘ are included in this presentation as well as an introduction into MACH Acoustics’ Web Based Design Tools, showing how best to position a building on site, how to minimise levels of embodied energy and select partitions between rooms. The annual Institute of Acoustics Conference was held on 5th and 6th September in Kenilworth and MACH Acoustics’ Chris Jones was honoured to be invited to speak and present his paper. 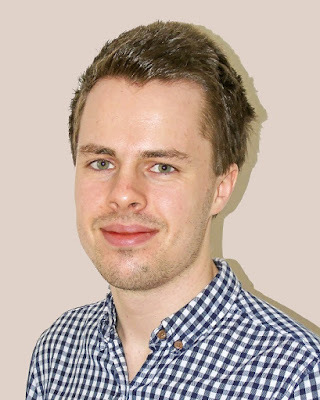 Chris has been researching “STANDARDISING THE TESTING AND MODELLING METHODS OF PREDICTING THE SOUND REDUCTION THROUGH OPEN WINDOWS” and this was extremely well received. The current approach is to simply use a 10 - 15 dB reduction across the open window. This does not account for the window type, open area or angle of incident sound. Whilst research has been conducted into these factors, the lack of a standard method of testing, modelling and quantifying the acoustic performance has prevented the uptake of an improved method by acoustic and facade engineers. This paper builds upon the research of collaboration with MACH Acoustics and The University of Bath - Blanco, Nunes and Lo (2014) and Jones (2015) in summarising the challenges in quantifying the performance by considering existing test methodologies from British Standards and extensive laboratory testing by Napier University (2007). 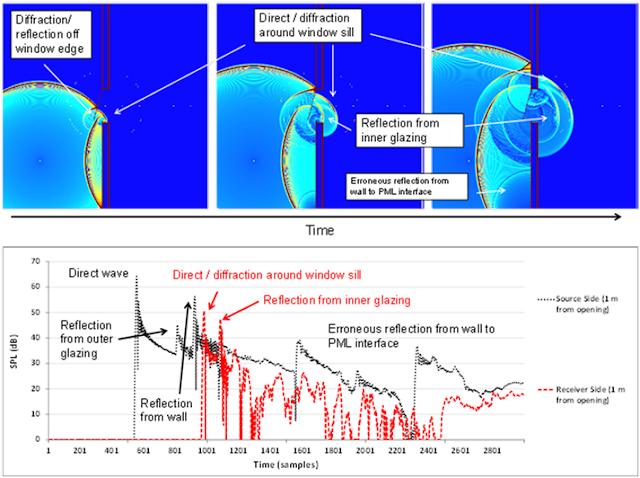 The potential of using FEM and FDTD modelling as a tool of visualising and understanding sound propagation through an open window is summarised. 2D FDTD modelling by Jones (2015) has examined the effect of the window variables and the accuracy of simulations by recreating Napier University (2007) test data, before using this to propose the concept of a simple mathematical model. The aim of this paper is not to conclusively recommend a standardised method, but to present existing information and new research in a balanced manner that will inspire a discussion within the acoustics industry as to how such a method might be agreed. 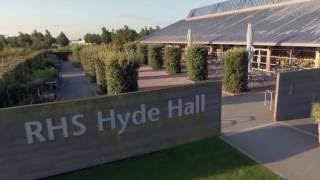 RHS Garden Hyde Hall is a public display garden run by the Royal Horticultural Society in the English county of Essex, east of London, the largest RHS Garden comprising 360 acres. The venue also includes several buildings, and the new to be completed Hilltop Restaurant and Activity Barn will help to create an enticing destination for visitors to RHS Garden Hyde Hall. To describe the creativity and structure of the scheme, Architects Cullinan Studio says “the design for the Hilltop Restaurant and Activity Barn is characterised by a rigorous and repetitive structural language - a splayed, glue-laminated timber portal frame will march along the loft Restaurant and Activity spaces, intersecting at a delicate nodel point at the apex. The nodel point will simultaneously brace the structure whilst supporting the long cantilevered gables at the southern ends”. MACH Acoustics is delighted to be supporting with acoustics consultancy. The project is attractive and will no doubt delight many visitors for years to come. The Computational Foundry is a key building in the new Bay Campus completing the central square of the site. Working with AHR and Willmott Dixon, MACH Acoustics is delighted to be supporting on this important project. The building is being design to create a hub for Mathematics and Computer Research and to encourage collaboration through designing spaces for interaction, meeting pods and the "research crucible". The Bay Campus enables the University to increase its' footprint - which pioneers the way for co working collaboration with industry and academics. They will share not only the same site, but also laboratories and facilities.